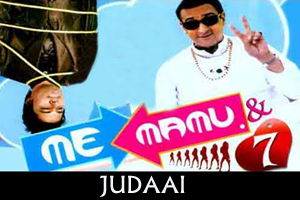 Lyrics Of Judaai From Movie - Me Mamu & 7 (2011): A Title song sung by Raja Hasan and Music has been Composed by Sanjay and Vishal. The Audio of this song is available on Youtube at the Channel music centered station. The Audio is of 5 minutes and 59 seconds duration. Lyrics in Hindi (Unicode) of "जुदाई"